Display your canvas photos in a clean modern way! This Contemporary cluster canvas grouping is ideal for bringing a warm rustic feel to any modern space, without taking away from the overall style of a more contemporary home or apartment. Choose 4 of your favorite photos, two horizontal and two that can be cropped for square canvas prints. Arrange them to fill an empty space on your wall and instantly cozy up your place with custom canvas prints. Highlighting your precious memories so family and friends can enjoy the smiles you've shared together will bring joy to all who see them. You will easily bring the feel of rustic coziness to your modern home with The Contemporary cluster canvas grouping. You will be adding your pictures to your wall decor in a clean, modern way showing the contemporary style of your home or apartment. Decorate any space, home or office, with a stunning cluster of wrapped canvases. Printing your digital memories on canvas presents your photos with a unique modern look. Whether you are displaying your canvas cluster in your home, your office or an art gallery, they will stand out and catch the attention of anyone entering the room. Your memories are precious to you so printing your digital pictures to canvas means showcasing them for others to appreciate as well. For another decor enhancing option, our Limelight canvas cluster also makes the perfect wall decor for any space, rustic or modern. Aside from friends and family experiencing your memories through your canvas arrangements, you can use The Contemporary to create gorgeous wall decor for any room. Bring out that favorite vacation picture of your daughter playing in the sand. Print that breathtaking picture you captured of the Grand Canyon. Wherever you decide to take your family for vacation, special moments are always being created. Creating a warm cozy feel in any room, with the modern look you love, is easy to do with stunning gallery wrapped canvas clusters. The Contemporary canvas cluster is perfect to feature your beautiful growing family in an ultramodern way. You’ve scheduled a photo shoot for the entire family and now you’re looking for a unique way to display them. Maybe your kids are still young, or perhaps they are grown and living out on their own. Either way, gathering your family for a photo shoot can be a fun and exciting time. With four canvases to print pictures on, you have the opportunity to get creative with poses, facial expressions and fun props to capture the true essence of your family. If you decide you want to do something different from the traditional photographs in a studio, dress your family up in their best and head out to the park. Nothing like family time and enjoying a day out in the park! Get a beautiful shot of everyone sitting together on the grass. Capture a candid moment of your precious kids on the grass. Use the other 2 canvases to do something fun! Push each other on the swings or go down the slide together to create some fun memories. Many times, decorating a home or office (or both) can be overwhelming. Not only do you have to find the photos, you have to decide which canvas sizes will fit nicely together on your wall. 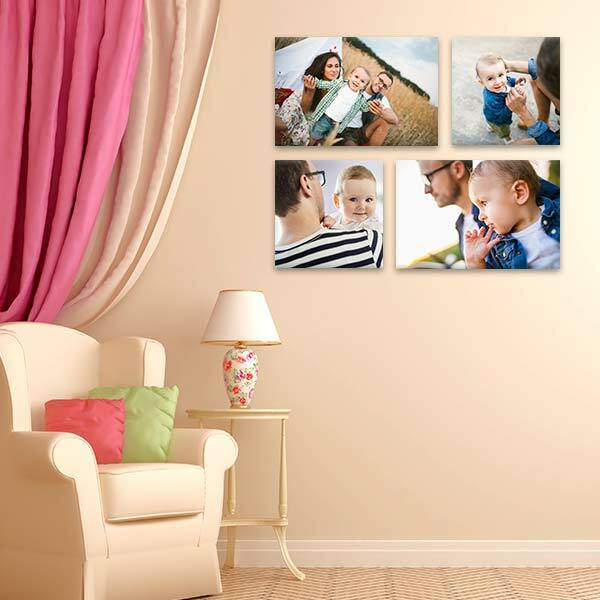 At Mailpix we have made it easy to create clusters of canvas to accommodate every wall space. We’ve done the work for you! We figured out what sizes will fit well together to bring you the perfect cluster arrangement, making the decision process easier for you. Take that sunset picture with your family relaxing in the foreground and turn it into a canvas art piece for the home office. Remembering the wonderful moments you had with your loved ones is as easy as printing your digital photo to canvas and hanging it on the wall. The memories from your most loved vacations will continue to bring you the feelings of relaxation every time you enter the room. There are so many holidays throughout the year to take fantastic photographs of your family. Special holidays and traditions can be the perfect setup for great photographed memories. Everyone is already looking great, family that may not have the opportunity to be around much is visiting and smiles are showing up everywhere you look. Aside from holidays, special occasions like weddings, anniversaries and birthdays are a great way to gather family for a special photograph together. These are special moments that deserve to be remembered and printed on professional quality wrapped canvas. Gather grandma and grandpa with the kids and take a few special pictures of those tender moments together. Whether you are sitting them down for a group picture or taking a few candid photos of the time spent together, you are sure to capture the love and affection shared in that moment. The Contemporary Collection is a great way to add your own personal touch to any room while expanding as your memories grow. This cluster allows you to expand in any direction if you have more space to cover. 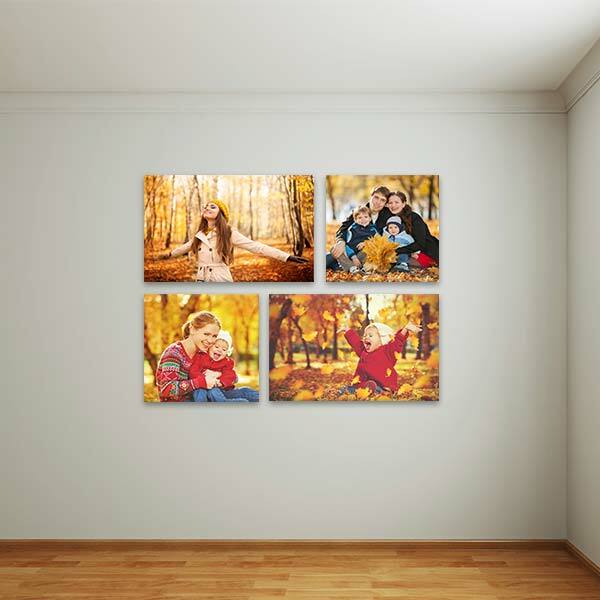 Capture every precious moment and print your favorite smiles on a collection of four beautifully wrapped canvas pieces. This cluster includes two 12”x18” canvas, rectangular and slightly longer in length, and two square 12”x12” canvas which allows you to cover a large space approximately 32”x26”. Each canvas is delivered with a professionally sealed back and is ready to hang in your home just as soon as you remove the packaging. Give your family memories the attention they deserve by printing them on ready to hang, beautifully wrapped canvas pieces. If you have already decorated the walls in your home but need a thinner canvas to place on your end table or mantle, canvas minis may be just what you want. Our Canvas Lites are thin, flexible and will stand on any shelf or table. The table or mantle can be decorated with all your precious memories without being concerned for broken frames or glass. If you like the look of modern metal art on your walls, our Aluminum Panels will provide a contemporary finish with a personal touch. All your favorite pictures can be printed on a smooth shimmery metal panel. Lifted away from the wall, your guests will be admiring the floating photos on the shimmering aluminum you have hanging on your walls.